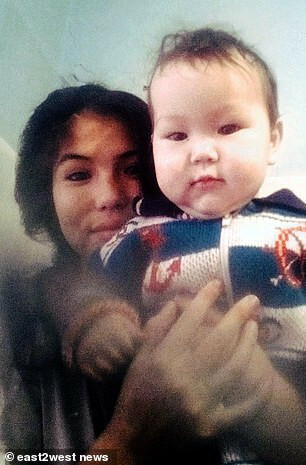 Baby Maxim Sagalakov was left by his mother Viktoria, 20, in the care of her parents in the Khakassia district of Russia. When she returned home, she was shocked to find her child’s charred remains in the stove of the family’s house in Kharoy village. The exact cause of death is still under forensic investigation but it is believed the child died from incineration after being burned alive on Tuesday. A neighbour said the grandfather had been out and got drunk on vodka. When he returned the child was thrown into the stove. The grandparents were drunk and killed the baby. A family member found the body of the boy badly damaged by the high temperature inside the stove. The grandmother, 42, and grandfather, 47, who’s surname is Miyagashev, have both been arrested and a criminal investigation has been launched into the ‘deliberate murder of a helpless minor’, said law enforcement sources. If convicted, they face a life sentence. Mourning her son, mother Viktoria Sagalakova, 20, left an emotional message on social media. Rest in peace, my beloved son. My dear little son. My pain does not ease even for a minute. How will I cope with it that you are not with me? I can’t hug you. Only your photograph is here with your kind and tender look. I look at your picture and you are smiling to me. I miss you so much my son. Please come to see me just for one second. Come to see me in my dreams. I know that you see everything now because you are flying so high. A relative and neighbour Natalia Sagatayeva said the grandparents had often cared for the child while the mother was away and looked after him well. I just can’t believe this. I am still shocked. They took good care of the boy, fed him. My children played with him. How could it happen?